November is always one of my favorite months for fashion just after December. The weather shifts to winter and layering becomes a necessity where I live. 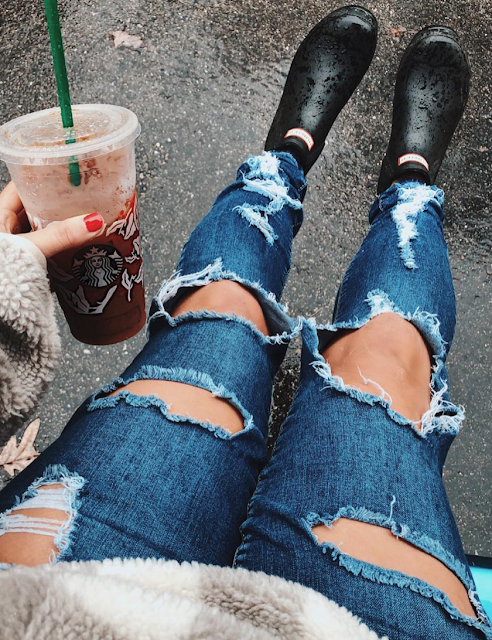 The first snow fall makes fashion more challenging but definitely more fun. 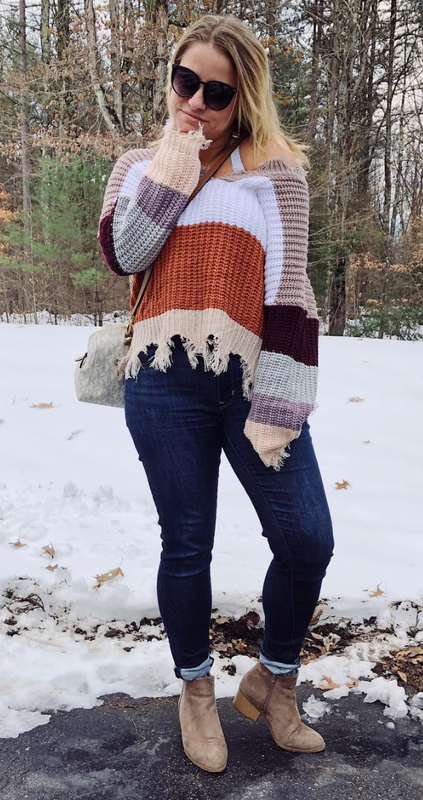 I love piecing outfits together and layering different textures and styles. If you would like to see daily outfit pictures make sure your following me on Instagram (@whosthemo). I share a lot of behind the scenes stuff via Instagram stories as well. 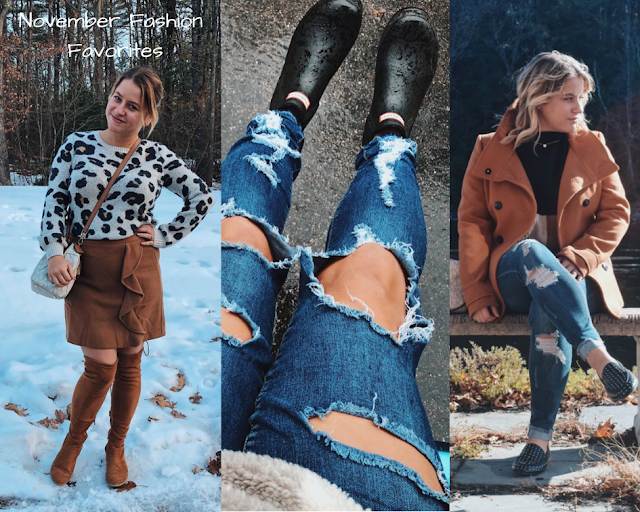 Without going on let's get into the nitty gritty of the post...my fashion favorites for the past month. I have been having I guess you could say a love affair with affordable fashion lately and all of these items are great pieces to add to a winter wardrobe. These babies have been making an appearance on many of my Instagram photos lately not only for their aesthetic, but also for how comfy and warm they actually are. These almost feel like I'm wearing slippers in public, with out looking like a wack-a-doo. Not only are they one of my staples this season but they are under $25, yes you read that right....UNDER $25!! I have been loving Target lately for fashion pieces and think they are a great place to shop for affordable and fashionable shoes. 2. H&M coat-linked similar one. Okay, so I purchased this one last year, but I will link a similar one. The color of this coat is so vibrant and it really stands out from other camel coats out there. I love layering this with all my chunky knits and it just makes so many outfits look way more put together. I only have one pair of these right now, but let me tell you...I will be wearing these babies to death. I have had a new love for camel colors lately, just because they are so versatile and go with so many outfits. I love wearing these with skirts, dresses, and even jeans. These are an absolute necessity if you live in an area with significant rain or snow. I love how easy these are to throw on over warm socks and go out in the snow. I will say they are shorter, so if you want to use these as an every day snow boot I would invest in the taller pair. 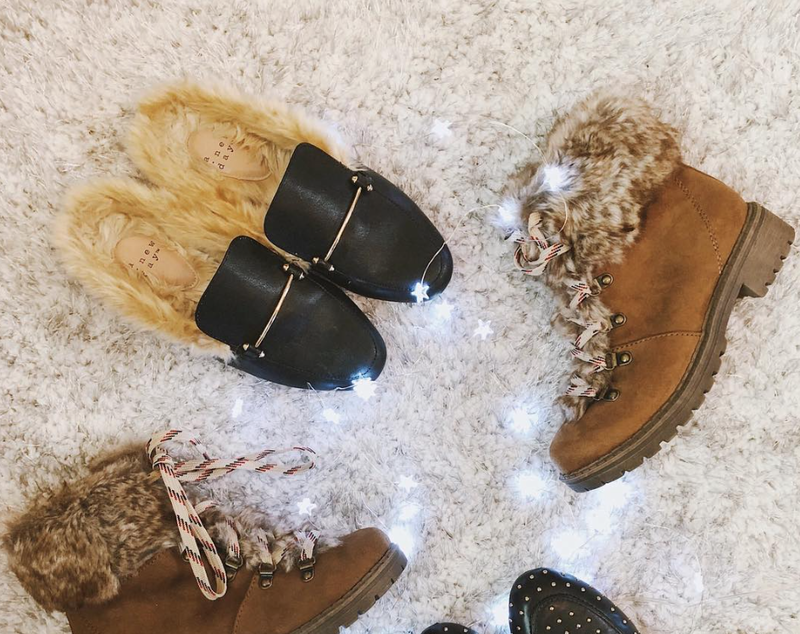 I have Sorel boots that I use for that so I'm not to worried, I just love how these are shorter and can be worn in the summer months too. 5. Vestique x Mumuandmacaroons sweater-linked a similar one. I had seen this sweater all over Instagram, and knew I had to add it to my ever growing collection of knit wear. I love the stripe details and the destroyed look is really popular right now. The slouchy fit is perfect to pair with a bralette and some jeans for a casual and cozy look. This is a new brand for me and actually one that contacted me via Instagram. I have a couple pieces from them, but this is my favorite of the bunch. 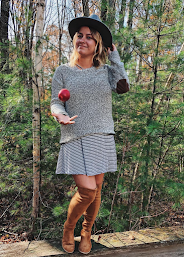 The cream color is perfect for the winter months and I love the scalloping detail and the fact the the cold shoulder portion can be tied at the top to offer a unique fit. 7. 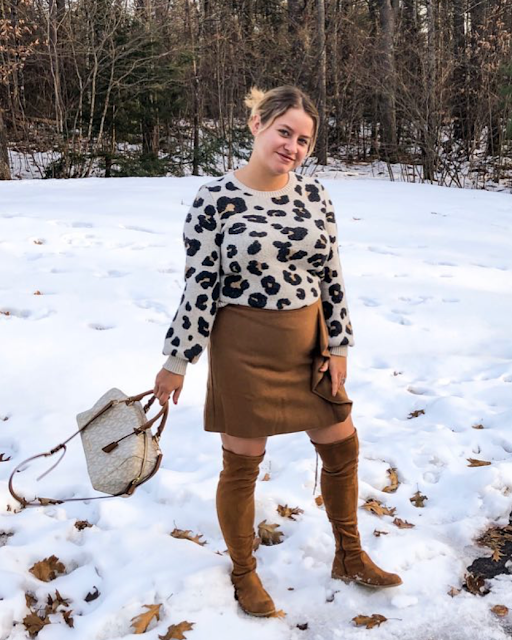 Loft leopard print sweater- I couldn't find the sweater so I linked the dress. Leopard print has been crazy popular the last couple months and this sweater is so darn adorable. I love the poofy sleeve detail and the fabric is so soft and cozy. 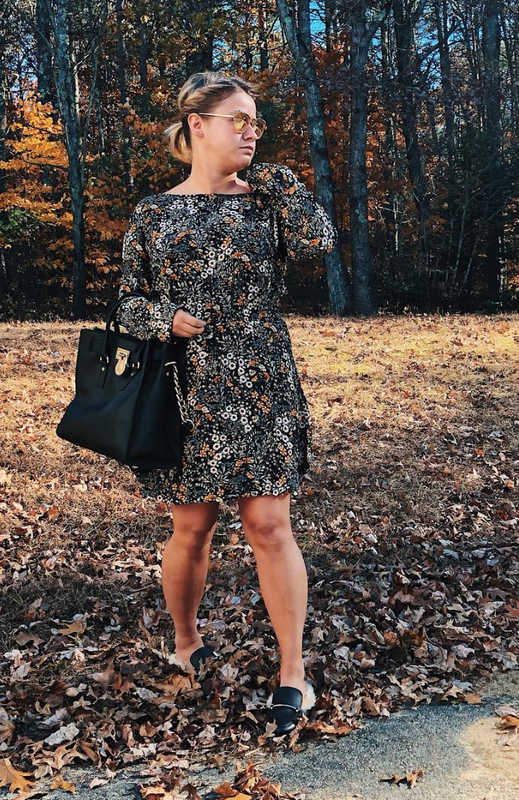 I love how this is a darker floral dress and it isn't too girly, the floral detailing is smaller and this just looks so cute with over the knee boots and a sweater layered over the top. I literally wear this all around the house and it is my go to comfy sweater when I want to feel all the cozy vibes. The fuzzy detailing looks so cute layered over dresses and the color matches with so many outfits.